Tonight on CBS their hit drama Criminal Minds returns with an all-new Wednesday, October 17, 2018, season 14 episode 3, called “Rule 34,” and we have your weekly Criminal Minds recap below. 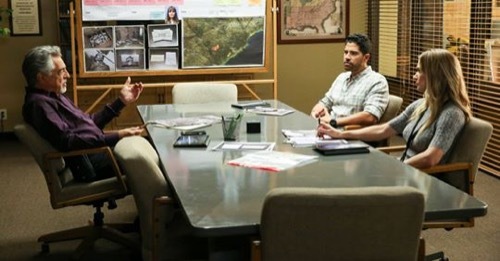 On tonight’s Criminal Minds episode season 14 episode 2 as per the CBS synopsis, “Packages with gruesome contents are delivered to six people in the Washington, D.C., area, and the BAU must first figure out what connects the recipients before they can identify the UnSub. Someone mailed body parts to six different women in the DC Metro area on tonight’s all new episode of “Criminal Minds”. The parts seemed to belong to one man. The local police talked to the women that were forced into this sordid tale and none of them were missing loved ones. They also didn’t know each other. The women were from all walks of life and were at various different ages however someone chose to send them each a package of dismembered body parts and so the BAU were brought in. They tried to figure out what could be the motive. The the crime in it self might not be sexual only it doesn’t mean the Unsub hadn’t extracted some form of satisfaction from both the killing and sending those packages. The assault on both parties could be feeding into their drive for control and so the team talked to the women. They probably knew more than thought they did and so they asked them if they were someone that had a grudge against them. And they couldn’t think of anyone. The women were more than shocked. They were baffled as if there was no one they had recently turned down much less insulted and so the team didn’t find anything with them though they did try chasing down the courier that took the packages. The packages had been sent from a location that was recently close down for renovations and therefore the Unsub had doxed the tracking information. The team thought maybe if they talked to guy that oversaw the closed site that he would give them answers and they found something before they could make contact. Garcia found a site on the dark web that was streaming the murder of another victim and it was coming from the guy they wanted to talk to. The team raced to his location believing they could find this latest victim still alive and he ended up getting played. The guy they wanted to talk to was dead. They found his severed head at his home and it was found along with a laptop that was playing the latest murder. The Unsub had drawn the authorities to the wrong site on purpose and the message he later posted online showed him taunting the police. The police hadn’t been able to stop his first murder or his second and he had gone on to deliver the fresh parts to four more women, so the Unsub was flying high. Reid profiled him as someone that was getting off on the attention. He was taking more and more risks such like taunting the police because he wanted to burn as bright as he could. The Unsub was just going to keep on killing people until he was stopped and so his ego will be undoing. The team released their profile and they got to work to finding out who owned the website that the Unsub posted his video to. It turned out to be a website for fetishes. The owner said she allowed anyone to post anything because it was all about no names and no shames. She didn’t care that someone died because she figured someone had gotten off on it, but the team soon realize they weren’t going to crack her. She didn’t have a heart and so why should she care about anyone else’s. The later team stopped tried using legal measures to get information on the website and as they were doing that they tried finding these out about their Unsub. He had showed that he had some medical knowledge because he had used a paralytics on his victims and had dismembered them as someone that was familiar with surgical procedures. His videos even showed that he had tortured and killed his victims like they were on the operating table. And so Garcia used that to look for their Unsub. Garcia first ran a search to see if there was someone that the male victims had in common and she found one person – Emanuel Rask. Rask was a med student who got expelled after some videos came to light of him torturing an animal and, well, he assaulted the student that he thought ratted him out. He went to jail for assault and was recently released only to learn that his ex-boyfriend had married someone else. It was the boyfriend that his first victim and the second victim was a therapist that was treating him. Rask had killed them for the way he believed he was treated and he sent packages to the women as a gift. The women had at one point or another all helped him in his life and so he thought he should thank them by making them part of his narrative. He was that narcissistic! The team knew that Rask would try to turn another victim into a gift and they couldn’t think of someone he was more grateful to than Galina Kadiec. Kadiec had owned the website that allowed him to become famous and so Rask would try to repay her only he didn’t have another man he wanted to kill and that meant he would go after someone from Kadiec’s history. She was lied to and betrayed by her ex-husband. It would make sense if she gave his name to Rask in exchange Rask would kill the ex for her. So Rossi pushed Kadiec into giving him a confirmation and once he got it he went with his team in search for Byron Maddecok (the ex-husband). They ended up finding out they had been too late to stop Rask from kidnapping Byron and so they tried to figure out where Rask might have taken him. They couldn’t find anything in Rask’s background that could be used as a kill site and so they found a place in Kadiec’s background. She and her ex were fighting over a piece of property that neither of them could used and so that was the perfect place for Rask. The team went to the location and they found him as he was torturing his victim yet he wasn’t going to until Rossi introduced himself. Rossi found out that Kadiec was a found of his and that she as well as Rask had both enjoyed reading his book “Deviants”. Rossi used that fame and notoriety to trick Rask into believing that he could be part of the next book if he put his weapon down. And so Rask turned himself over because he couldn’t wait to become even more famous.